If you suffer from claustrophobia, Montero's may not be the dive for you. 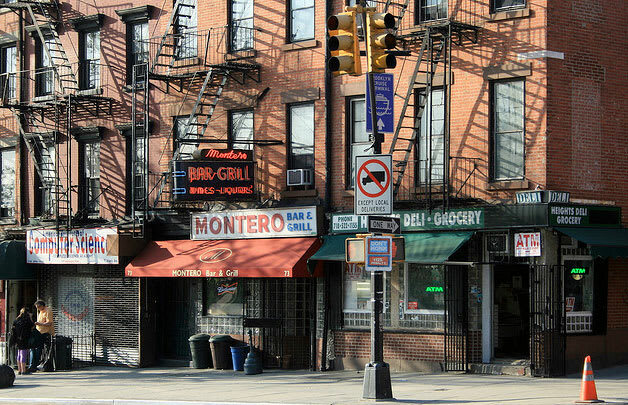 No, it's not one of those hallway type joints; rather, Montero's is full of stuff. Packed to the gills, actually. That's an appropriate pun to make because of the bar's nautical theme. The stuff constricting your breath in your chest is life rafts, life vests, model ships, newspaper articles about things that float (or one day stopped floating, tragically), and just about anything else you might associate with the sea (no tridents, though). The drinks are stiff, just like any salty dog would want. You might actually hear someone use the phrase "salty dog," and it won't be ironic. You're in Cobble Hill; even the hipsters are too poor for this neighborhood.